VR is almost ready for prime time, but is prime time ready for it? For consumers, the cost of headsets are coming down quickly. Just last week, Facebook announced a new headset, called Oculus Go, for $199. 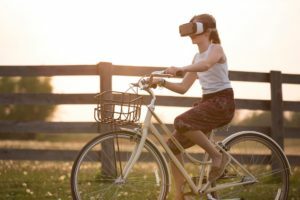 And VR technology, along with its sister augmented technology (which superimposes digital information on the real world), is not just for gamers anymore. Companies are using the technology in training, recruitment and manufacturing applications. But as Jordan’s experience shows, VR raises some disturbing questions. Was that groping an actual assault? Could the real person whose avatar groped her be charged with a crime? What kind of protections should VR vendors include to keep such things from happening? These are legal gray areas that companies and attorneys are starting to ponder. There will be a certain “creepy” factor as VR technology becomes more common in daily life. Imagine, for example, “a near-future world in which I’m going to be able to walk up and say hello to you and my glasses are going to remind me of your name and your spouse’s name and your kid’s names and maybe the last time we got together,” said Lemley. That may be fine if we already know each other. But what if a perfect stranger can do that? Between VR, facial recognition technology and publicly available data, it’s conceivable, say some legal scholars. Definitely creepy, but is it an invasion of privacy? Are there laws against it, or should there be? At the heart of all these questions it a very basic one: How much of virtual reality is real? As the technology goes mainstream, the public and the law will be forced to find an answer.